The food community is largely a friendly and supportive place. Wherever in the world I've traveled chefs have always been welcoming, accommodating, and happy to connect and share all manner of food experiences. After all, it's in the nature of the hospitality business to be... well...hospitable. And people who are drawn to this profession more often than not have nurturing and generous spirits.When Lutèce was in its hey day as top New York restaurant, André Soltner allowed me to bring a special birthday cake into the restaurant. When editor Pam Chirls and author Lisa Yockelson and I went to Restaurant Daniel for an after event nightcap, not only did Daniel Boulud voice no objections to my having brought a piece of coconut cake from my then upcoming book, the wait person graciously insisted on plating it for us. Scott Conant had no problem with my bringing an entire birthday cake into Alto for lunch. Welcome to the new rude reality where it's cool to be cruel: the world fashioned after Simon Cowell of American Idol, where mean insults and sarcasm rule... the world of Gorden Ramsays, David Changs, and restaurants like the Spotted Pig, a world where guests are made to feel lucky they managed to get a seat, even though that seat more often than not has no back, surely to encourage the eater to leave as soon as possible to make room for the next desperate one who has bought into the hype du jour. The Breslin, sister restaurant to the Spotted Pig, was recommended by a food friend so I lost no time in arranging a lunch date for two other favorite food friends while Woody was in town helping me film a video. Typical of the new trendy restaurant style, The Breslin did not accept reservations, so we agreed to meet at noon before the crowd (which never materialized). Nancy arrived a little early but they would not seat her (writing on the wall...). We enjoyed the food and each other's company but it all fell apart when we brought out a little box containing two small slices of chocolate cake leftover from the taping of the day before. Woody asked the wait person if it would be ok to bring out the cake and if he would bring plates and forks. After several reproachful comments from the 20 something year old, along the lines of: "this is a restaurant..." I explained that we were all pastry chefs and just wanted to do a little tasting of a cake that had just been filmed. I gave him my card and asked if he would like to offer one of the pieces of cake to the pastry chef. He revealed that she wasn't there so I offered him a taste of the cake. "I don't do that kind of thing." was his haughty reply. He left with his nose in the air and his stride smacking of moral superiority as if to imply that the rest of us were moral misfits. I felt like I was back in the second grade! It was as though a storm cloud had eclipsed the joyful mood of our gathering. Oh! the wait person brought back four forks, pushing them onto the table, but no plates. 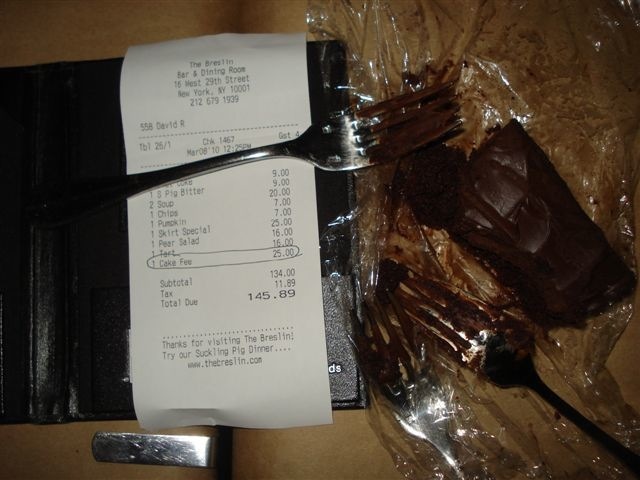 We started to taste the cake, still set on its plastic wrap "plate," when he returned with the information that he had reported us to the chef who said we'd have to pay a fee for the forks. I asked him if it was a "forkage fee" and he smiled and said "yes." I suggested that he might have mentioned that before he brought out the forks. The bill came and that fee for the use of four forks was a shocking $25. I signed the charge card form and on the line designated for the tip I entered "cakeage fee." (Nancy left a generous tip because she is spiritually evolved enough not to allow other's bad behavior to affect her own shining goodness.) The morals of the story: Food can never be sweetened by bad and inhospitable service. Never be rude to writers. Nancy Weber packed up the leftover cake to take for a special dinner at Union Square that night saying "Danny Meyer would never do such a thing!" (Danny is known in the industry as the "king of hospitality" and is loved by all.) So, what do we writers do when so deeply offended? We write. I wrote this, Nancy is writing a commentary as a limerick (which will appear soon), and David Shamah (restaurateur, my beloved protégé, and the fourth friend of our little party) received this amazingly coincidental e-mail from Danny Meyer's office: Dear Friends, For years we have received an increasing number of requests from friends asking to learn our recipe for creating the consistent feeling of hospitality patrons have come to expect from our restaurants. I am thrilled to announce the newest member of our USHG family: Hospitality Quotient, a learning business for individuals and organizations who want to understand and apply the transformational power of hospitality. With interactive classes and training programs, HQ will allow us to work with business leaders who want to enrich their employee and customer experiences and who want to assure that their organization becomes and remains a favorite within its category. Susan Salgado, who has directed our Culture and Learning department for the past seven years, will lead HQ as Managing Director and program facilitator. Superior products and excellent service will always remain critical elements in any successful organization - but they are no longer enough to distinguish your business. Instead, we've learned that - hospitality - how you make your customers feel is what sets you apart from the pack. We welcome the opportunity to learn more about your company and how incorporating hospitality might have an impact on your business. Thank you for your continued loyalty and support. Warm regards, Danny Meyer The Breslin staff would do well to take a lesson from Danny.